Hope that it is cloudy this Friday, Feb. 2, 2018. 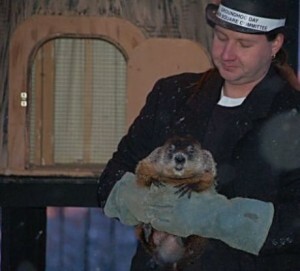 It’s Groundhog Day so the critters known as Punxsutawney Phil in the movie and in Punxsutawney, PA and called Woodstock Willie in Woodstock, IL where the famed movie was filmed, will take over the weather person’s job by predicting what to expect. Sunny means the critter see their shadow so return to hibernation and winter will continue for six more weeks. Cloudy means no shadow so they remain out and spring will come early. To wake Woodstock Willie from his winter hibernation, there will be a polka band playing somewhat similar to the band in the movie. No matter what happens, the delightful movie co-written by Harold Ramis and Danny Rubin and starring Bill Murray as weatherman Phil Connors and Andie Macdowell as news producer Rita Hanson, is brought back to life, again. In the Chicago area, movie fans can see it free in Woodstock at 10 a.m. Feb. 2-4 and walk the movie sites at 9 a.m. Feb. 2, noon Feb. 3 and 12:30 p.m. Feb 4. Free walking tours of the movie sites begin at the Moose Club, 406 Clay St. Friday and Saturday and at at Stage Left Café, 125 Van Buren S. Sunday. Tours end at the B&B where Murray woke up each day. Called the Cherry Tree Inn, the place is a friendly destination and will host walkers with warm cider. Lying northwest of Chicago, the town’s picturesque square appealed to Ramis who wanted to be within driving distance of his home in a Chicago North Sore suburb. Woodstock celebrated 25 years from its filming there in 2017 but this year marks the 25th anniversary of its release in 1993. So why a woodchuck or groundhog prognosticator? The story is that farmers who emigrated to the eastern US from Europe brought the legend with them because back home farmers thought spring was coming if they saw badgers. Whatever the day’s prognostication, the movie is a joy and Woodstock is a charming town to visit. For more information visit Woodstock Groundhog and Punxsutawney Groundhog.